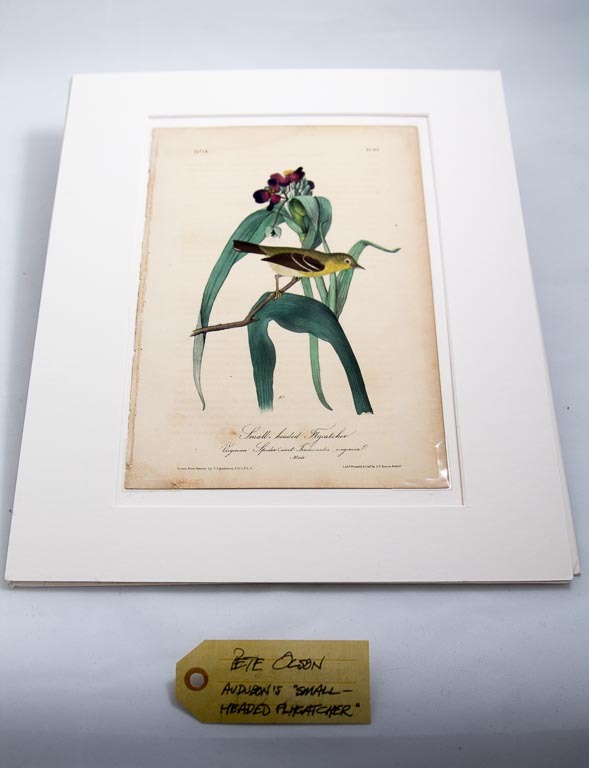 Audobon print, small-headed flycatcher | That Belongs in a Museum! This is a print by John James Audobon who most of you guys have heard of. In the 1820s he made big prints and in the 1840s they used a camera lucida to transfer these big prints down onto little lithostones so they could make money printing a lot of them with lithography then hand coloring them. So this is one of those [small prints]; they are still fairly inexpensive…and the reason I brought this particular one is that it is the kind of image that I would have passed by without another thought when I was younger because I liked hip, expressive artwork, and this was old and conservative and looked like an old lady ought to have it so I didn’t care, but now I have developed an appreciation for these things and especially this one.